Harvest Roast brings you the ultimate pumpkin seed experience! Our slow-roasting process creates the optimal texture while preserving nutrients and the delicious flavor. Naturally containing niacin, magnesium, zinc, phosphorous, iron, linolenic acid and amino acids (arginine and glutamic), pumpkin seeds contain both omega-3 and -6 essential fatty acids. 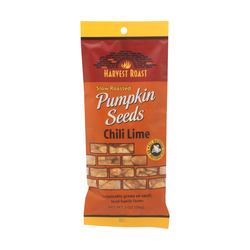 Harvest Roast premium Slow-Roasted Pumpkin Seeds are the perfect fiber-filled snack!